Well, Johanna is already there. She's really the Ronda of that division now; great all around fighter, good talker, willing to be the heel. Johanna ?? Or did you mean Julianna Pena ? Neither. I meant the champion, Joanna Jedrezyck, or however you spell it. Fact that you didn't immediately know may mean she's not that big a star. I see she is a strawweight and admittedly I'm not familiar with those fighters at all aside from Paige VanZant. I "assumed" you were talking the bantamweights at first. If you get a chance, watch the JJ fight with Claudia Gadelha from this past Friday. You'll be impressed with both of them. No making weight issues for tomorrow's fight this time. Not very surprising really, but Miesha loses by decision to her Ultimate Fighter protege Raquel Pennington and then announced her retirement when Dana White interviewed her right after the fight in the octagon. I only saw the last half of the third round and if that was indicative of the whole fight then it wasn't all that close. Whether it is MMA or boxing, it's really tough for a fighter to come back after the type of beating Miesha took against Amanda Nunes. Especially this soon afterwards. After tonight I'm sure she realized that she just can't hang with the younger, up and coming women, no point of hanging around to be a stepping stone. Miesha has already expressed an interest in being an analyst for FOX for their fights. Of course there will be acting opportunities as well. 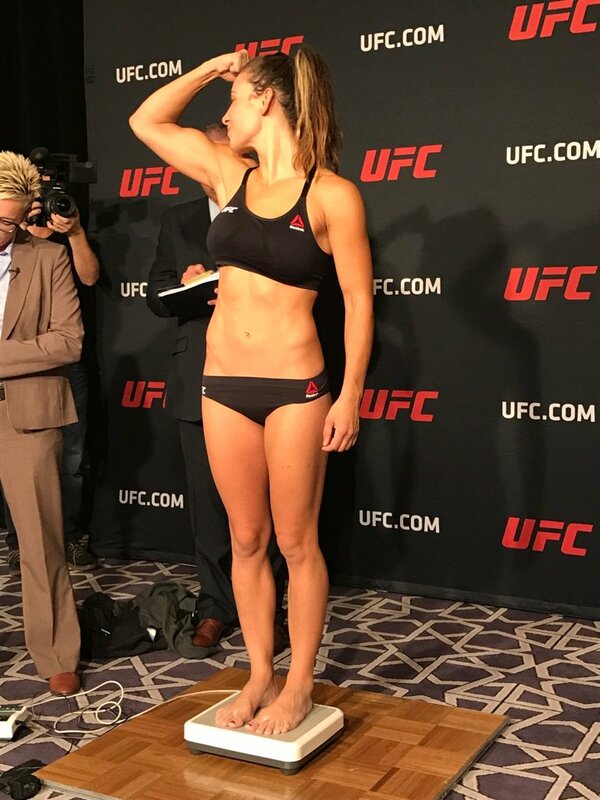 All that said, I think Miesha will take an extended break from training and fighting and get the itch in about year to at least give it one more shot. If she doesn't fight again, hopefully this isn't the last we've seen of her flexes. Not very surprising really, but Miesha loses by decision to her Ultimate Fighter protege Raquel Pennington and then announced her retirement when Dana White interviewed her right after the fight in the octagon. I only saw the last half of the third round and if that was indicative of the whole fight then it wasn't all that close. Whether it is MMA or boxing, it's really tough for a fighter to come back after the type of beating Miesha took against Amanda Nunes. Especially this soon afterwards. After tonight I'm sure she realized that she just can't hang with the younger, up and coming women, no point of hanging around to be a stepping stone. Joe Rogan interviewed her. I saw the whole fight. Miesha was outstruck standing, which was not surprising. But what was surprising is that she was also outgrappled. At no point was Rocky ever in any trouble. Miesha just didn't have it this time, and I was thinking that she would actually announce her retirement right then. It might have been from the fight with Amanda. It also could be because she's having some relationship difficulties with Bryan Caraway. If they break up in the long run that's good for her, because Bryan is known as something of a meathead. In fact it's because of Bryan that Ronda and Miesha so hate each other. I agree with Will, she unretires in a year, especially if she can get another shot at Ronda. It would be fitting if that is a dual farewell fight. As for the other fights, it's worth catching JJ and KK from rounds 4-5. The first three were just Joanna out pointing Karolina, but not dominating her. And Liz really just bullied her opponent around. And of course Conor was incredible, as was the Woodley-Wonderboy fight. The whole show was a huge success for MSG. I hate to say this but, I wonder if she'll go crawl under a rock the same way Ronda did after getting beat. That's not Miesha. She doesn't have that dark side that Ronda has. She'll be a FOX analyst pretty shortly. 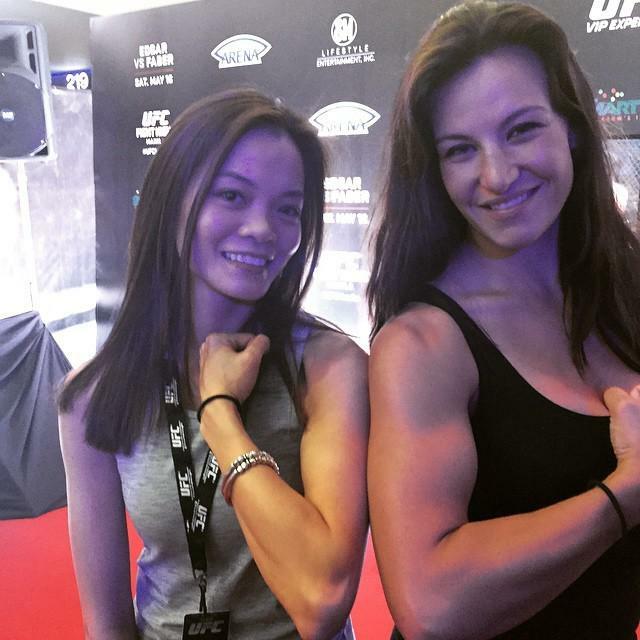 Not fighting anymore but Miesha still has the guns!